The 2013 Jacksonville Jaguars season was the franchise's 19th season in the National Football League, the first under general manager David Caldwell, and the first under head coach Gus Bradley. Although they missed the playoffs and started 0-8, the Jaguars improved upon their franchise-worst 2–14 record from 2012; but failed to improve their 1-7 home record from last year. Much like 2012, the root of their victories were intra-division. The Jaguars also gained a close non-divisional victory over the Browns to finish 4-12. LB Geno Hayes, signed on March 13, 2013. DT Roy Miller, signed on March 15, 2013. RB Justin Forsett, signed on March 15, 2013. CB Alan Ball, signed on March 15, 2013. DT Sen'Derrick Marks, signed on April 2, 2013. DT Brandon Deaderick, claimed off waivers on May 14, 2013. CB Will Blackmon, signed on August 28, 2013. WR Stephen Burton, claimed off waivers on September 1, 2013. SS Winston Guy, claimed off waivers on September 1, 2013. TE Clay Harbor, claimed off waivers on September 1, 2013. OT Guy Whimper, released on February 27, 2013. S Dawan Landry, released on March 8, 2013. CB Aaron Ross, released on March 8, 2013. G Eben Britton, declared free agent on March 12, 2013. CB Derek Cox, declared free agent on March 12, 2013. RB Rashad Jennings, declared free agent on March 12, 2013. FB Greg Jones, declared free agent on March 12, 2013. DT Terrance Knighton, declared free agent on March 12, 2013. CB Rashean Mathis, declared free agent on March 12, 2013. CB William Middleton, declared free agent on March 12, 2013. LB Daryl Smith, declared free agent on March 12, 2013. WR Laurent Robinson, released on March 13, 2013. DT C. J. Mosley, released on April 1, 2013. RB/FB Montell Owens, released on May 16, 2013. DE Austen Lane, released on June 13, 2013. WR Jordan Shipley, released on September 1, 2013. FS Dwight Lowery, released from injured reserve on November 4, 2013. DE Jeremy Mincey, released on December 13, 2013. C Brad Meester, retired after 14 seasons with the team. Defensive tackle D'Anthony Smith was traded to the Seattle Seahawks for a conditional draft pick. Smith was released by the Seahawks on September 24, meaning the conditions of the trade were not fulfilled and the Jaguars did not receive the draft pick. Left tackle Eugene Monroe was traded to the Baltimore Ravens for the Ravens' fourth and fifth-round draft picks in the 2014 NFL Draft. ^[a] The Jaguars traded their original fourth-round selection (No. 98 overall) selection to the Philadelphia Eagles in exchange for the Eagles' 2013 fourth- (No. 101 overall) and seventh- (No. 210 overall) round selections. # Blue/Red indicates the International Series game in London. JAX – Dustin Colquitt punt blocked by J.T. Thomas for safety Jaguars 2–0. KC – Donnie Avery 5-yard pass from Alex Smith (Ryan Succop kick), Chiefs 7–2. Drive: 3 plays, 24 yards, 1:20. KC – Junior Hemingway 3-yard pass from Alex Smith (Ryan Succop kick), Chiefs 14–2. Drive: 2 plays, 21 yards, 0:33. KC – Jamaal Charles 3-yard run (Ryan Succop kick), Chiefs 21–2. Drive: 8 plays, 57 yards, 4:42. KC – Tamba Hali 10-yard interception return (Ryan Succop kick), Chiefs 28–2. OAK – Marcel Reece 11-yard run (Sebastian Janikowski kick), Raiders 7–0. Drive: 5 plays, 38 yards, 2:45. JAX – Josh Scobee 27-yard field goal, Raiders 7–3. Drive: 15 plays, 78 yards, 6:56. OAK – Sebastian Janikowski 46-yard field goal, Raiders 10–3. Drive: 10 plays, 44 yards, 2:47. OAK – Sebastian Janikowski 30-yard field goal, Raiders 13–3. Drive: 12 plays, 69 yards, 5:42. OAK – Sebastian Janikowski 29-yard field goal, Raiders 16–3. Drive: 7 plays, 43 yards, 3:56. OAK – Sebastian Janikowski 29-yard field goal, Raiders 19–3. Drive: 10 plays, 52 yards, 6:23. JAX – Clay Harbor 13-yard pass from Chad Henne (pass failed), Raiders 19–9. Drive: 6 plays, 49 yards, 1:54. SEA – Zach Miller 1-yard pass from Russell Wilson (Steven Hauschka kick), Seahawks 7–0. Drive: 7 plays, 71 yards, 3:27. SEA – Zach Miller 4-yard pass from Russell Wilson (Steven Hauschka kick), Seahawks 14–0. Drive: 6 plays, 40 yards, 2:56. SEA – Steven Hauschka 21-yard field goal, Seahawks 17–0. Drive: 5 plays, 44 yards, 2:43. SEA – Sidney Rice 11-yard pass from Russell Wilson (Steven Hauschka kick), Seahawks 24–0. Drive: 5 plays, 79 yards, 0:34. SEA – Sidney Rice 23-yard pass from Russell Wilson (Steven Hauschka kick), Seahawks 31–0. Drive: 3 plays, 33 yards, 1:26. JAX – Maurice Jones-Drew 2-yard run (Josh Scobee kick), Seahawks 31–7. Drive: 2 plays, 2 yards, 0:11. SEA – Doug Baldwin 35-yard pass from Tarvaris Jackson (Steven Hauschka kick), Seahawks 38–7. Drive: 5 plays, 58 yards, 2:26. JAX – Josh Scobee 33-yard field goal, Seahawks 38–10. Drive: 5 plays, 65 yards, 1:22. JAX – Jordan Todman 3-yard run (Josh Scobee kick), Seahawks 38–17. Drive: 9 plays, 52 yards, 3:09. SEA – Tarvaris Jackson 5-yard run (Steven Hauschka kick), Seahawks 45–17. Drive: 5 plays, 80 yards, 2:34. JAX – Josh Scobee 53-yard field goal, Jaguars 3–0. Drive: 4 plays, 6 yards, 1:11. IND – Adam Vinatieri 22-yard field goal, Tied 3–3. Drive: 11 plays, 54 yards, 3:43. IND – Darius Butler 41-yard interception return (Adam Vinatieri kick), Colts 10–3. IND – Trent Richardson 1-yard run (Adam Vinatieri kick), Colts 17–3. Drive: 6 plays, 81 yards, 3:28. IND – Adam Vinatieri 46-yard field goal, Colts 20–3. Drive: 10 plays, 44 yards, 3:18. IND – Coby Fleener 31-yard pass from Andrew Luck (Adam Vinatieri kick), Colts 27–3. Drive: 2 plays, 63 yards, 0:37. IND – Reggie Wayne 5-yard pass from Andrew Luck (Adam Vinatieri kick), Colts 34–3. Drive: 12 plays, 72 yards, 8:35. IND – Adam Vinatieri 28-yard field goal, Colts 37–3. Drive: 7 plays, 37 yards, 2:56. JAX – Justin Blackmon 67-yard pass from Blaine Gabbert (Josh Scobee kick), Jaguars 7–0. Drive: 4 plays, 93 yards, 1:57. STL – Matt Giordano 82-yard interception return (Greg Zuerlein kick), Tied 7–7. JAX – Josh Scobee 48-yard field goal, Jaguars 10–7. Drive: 7 plays, 50 yards, 2:55. STL – Greg Zuerlein 32-yard field goal, Tied 10–10. Drive: 8 plays, 66 yards, 3:10. STL – Lance Kendricks 16-yard pass from Sam Bradford (Greg Zuerlein kick), Rams 17–10. Drive: 1 plays, 16 yards, 0:08. STL – Austin Pettis 4-yard pass from Sam Bradford (Greg Zuerlein kick), Rams 24–10. Drive: 12 plays, 90 yards, 5:11. JAX – Josh Scobee 34-yard field goal, Rams 24–13. Drive: 7 plays, 53 yards, 1:52. STL – Greg Zuerlein 37-yard field goal, Rams 27–13. Drive: 10 plays, 65 yards, 3:35. JAX – Cecil Shorts 4-yard pass from Chad Henne (Josh Scobee kick), Rams 27–20. Drive: 12 plays, 80 yards, 4:25. STL – Austin Pettis 31-yard pass from Sam Bradford (Greg Zuerlein kick), Rams 34–20. Drive: 8 plays, 80 yards, 4:37. DEN – Julius Thomas 3-yard pass from Peyton Manning (Matt Prater kick), Broncos 7–0. Drive: 6 plays, 27 yards, 2:02. DEN – Wes Welker 20-yard pass from Peyton Manning (Matt Prater kick), Broncos 14–0. Drive: 12 plays, 95 yards, 6:08. JAX – Josh Scobee 50-yard field goal, Broncos 14–3. Drive: 10 plays, 48 yards, 4:26. JAX – Josh Scobee 30-yard field goal, Broncos 14–6. Drive: 8 plays, 28 yards, 2:20. JAX – Paul Posluszny 59-yard interception return (pass failed), Broncos 14–12. DEN – Knowshon Moreno 1-yard run (Matt Prater kick), Broncos 21–12. Drive: 8 plays, 80 yards, 2:44. JAX – Maurice Jones-Drew 5-yard run (Josh Scobee kick), Broncos 21–19. Drive: 9 plays, 80 yards, 4:33. DEN – Knowshon Moreno 8-yard run (Matt Prater kick), Broncos 28–19. Drive: 8 plays, 80 yards, 3:41. DEN – Knowshon Moreno 3-yard run (Matt Prater kick), Broncos 35–12. Drive: 5 plays, 41 yards, 2:19. SD – Danny Woodhead 2-yard run (Nick Novak kick), Chargers 7–0. Drive: 13 plays, 80 yards, 7:37. SD – Eddie Royal 27-yard pass from Philip Rivers (Nick Novak kick), Chargers 14–0. Drive: 10 plays, 80 yards, 6:08. JAX – Josh Scobee 30-yard field goal, Chargers 14–3. Drive: 18 plays, 68 yards, 7:46. SD – Nick Novak 20-yard field goal, Chargers 17–3. Drive: 10 plays, 79 yards, 6:21. JAX – Josh Scobee 23-yard field goal, Chargers 17–6. Drive: 8 plays, 75 yards, 2:54. SD – Ryan Matthews 3-yard run (Nick Novak kick), Chargers 24–6. Drive: 10 plays, 84 yards, 4:46. JAX – Maurice Jones-Drew 6-yard run (Josh Scobee kick), Jaguars 7–0. Drive: 3 plays, 19 yards, 1:15. JAX – Josh Scobee 32-yard field goal, Jaguars 10–0. Drive: 8 plays, 50 yards, 3:20. JAX – Josh Scobee 44-yard field goal, Jaguars 13–0. Drive: 7 plays, 19 yards, 3:18. TEN – Taylor Thompson 9-yard pass from Ryan Fitzpatrick (Rob Bironas kick), Jaguars 13–7. Drive: 8 plays, 52 yards, 3:44. JAX – Jordan Todman 5-yard run (Josh Scobee kick), Jaguars 20–7. Drive: 8 plays, 79 yards, 4:43. TEN – Rob Bironas 39-yard field goal, Jaguars 20–10. Drive: 11 plays, 59 yards, 5:02. TEN – Rob Bironas 37-yard field goal, Jaguars 20–13. Drive: 4 plays, 7 yards, 1:24. JAX –	Penalty on Chance Warmack enforced in end zone for a safety, Jaguars 22–13. TEN – Ryan Fitzpatrick 4-yard run (Rob Bironas kick), Jaguars 22–20. Drive: 5 plays, 72 yards, 1:43. 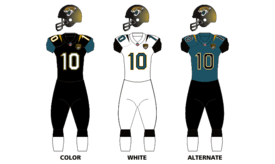 JAX – Will Blackmon 21-yard fumble return (Josh Scobee kick), Jaguars 29–20. TEN – Delanie Walker 14-yard pass from Ryan Fitzpatrick (Rob Bironas kick), Jaguars 29–27. Drive: 12 plays, 82 yards, 1:52. JAX – Danny Noble 62-yard pass from Chad Henne (Josh Scobee kick), Jaguars 7–0. Drive: 4 plays, 71 yards, 2:07. ARI – Larry Fitzgerald 14-yard pass from Carson Palmer (Jay Feely kick), Tied 7–7. Drive: 10 plays, 80 yards, 5:03. JAX – Maurice Jones-Drew 1-yard run (Josh Scobee kick), Jaguars 14–7. Drive: 7 plays, 46 yards, 2:42. ARI – Rashard Mendenhall 5-yard run (Jay Feely kick), Tied 14–14. Drive: 5 plays, 70 yards, 2:06. ARI – Jay Feely 21-yard field goal, Cardinals 17–14. Drive: 9 plays, 77 yards, 4:24. ARI – Michael Floyd 91-yard pass from Carson Palmer (Jay Feely kick), Cardinals 24–14. Drive: 3 plays, 91 yards, 1:29. ARI – Jay Feely 32-yard field goal, Cardinals 27–14. Drive: 5 plays, 8 yards, 2:16. JAX – Maurice Jones-Drew 1-yard run (Josh Scobee kick), Jaguars 7–0. Drive: 10 plays, 75 yards, 4:03. JAX – Josh Scobee 30-yard field goal, Jaguars 10–0. Drive: 7 plays, 73 yards, 4:01. HOU – Randy Bullock 49-yard field goal, Jaguars 10–3. Drive: 9 plays, 49 yards, 4:35. HOU – Randy Bullock 20-yard field goal, Jaguars 10–6. Drive: 13 plays, 83 yards, 6:34. JAX – Josh Scobee 53-yard field goal, Jaguars 13–6. Drive: 8 plays, 42 yards, 4:27. CLE – Willis McGahee 1-yard run (Billy Cundiff kick), Browns 7–0. Drive: 3 plays, 47 yards, 1:07. JAX – Clay Harbor 18-yard pass from Chad Henne (Josh Scobee kick), Tied 7–7. Drive: 8 plays, 80 yards, 3:47. CLE – Josh Gordon 21-yard pass from Brandon Weeden (Billy Cundiff kick), Browns 14–7. Drive: 11 plays, 92 yards, 5:17. JAX – Marcedes Lewis 8-yard pass from Maurice Jones-Drew (Josh Scobee kick), Tied 14–14. Drive: 3 plays, 17 yards, 1:16. JAX – Josh Scobee 44-yard field goal, Jaguars 17–14. Drive: 4 plays, 2 yards, 0:26. JAX – Josh Scobee 36-yard field goal, Jaguars 20–14. Drive: 1 plays, 0 yards, 0:05. CLE – Greg Little 4-yard pass from Brandon Weeden (Billy Cundiff kick), Browns 21–20. Drive: 10 plays, 80 yards, 5:16. JAX –	Penalty on Brandon Weeden enforced in end zone for a safety, Jaguars 22–21. JAX – Josh Scobee 25-yard field goal, Jaguars 25–21. Drive: 7 plays, 36 yards, 3:28. CLE – Josh Gordon 95-yard pass from Brandon Weeden (Billy Cundiff kick), Browns 28–25. Drive: 1 plays, 95 yards, 0:19. JAX – Cecil Shorts 20-yard pass from Chad Henne (Josh Scobee kick), Jaguars 32–28. Drive: 9 plays, 80 yards, 3:15. JAX – Marcedes Lewis 1-yard pass from Chad Henne (Josh Scobee kick), Jaguars 7–0. Drive: 13 plays, 80 yards, 6:12. JAX – Cecil Shorts 6-yard pass from Chad Henne (Josh Scobee kick), Jaguars 14–0. Drive: 4 plays, 86 yards, 1:30. HOU – Keshawn Martin 8-yard pass from Case Keenum (Randy Bullock kick), Jaguars 14–7. Drive: 12 plays, 91 yards, 6:57. JAX – Josh Scobee 40-yard field goal, Jaguars 17–7. Drive: 6 plays, 37 yards, 6:57. HOU – Randy Bullock 34-yard field goal, Jaguars 17–10. Drive: 5 plays, 30 yards, 1:20. JAX – Jordan Todman 21-yard pass from Ace Sanders (Josh Scobee kick), Jaguars 24–10. Drive: 6 plays, 88 yards, 2:17. HOU – Garrett Graham 6-yard pass from Matt Schaub (Randy Bullock kick), Jaguars 24–17. Drive: 7 plays, 76 yards, 3:02. HOU – Randy Bullock 31-yard field goal, Jaguars 24–20. Drive: 7 plays, 76 yards, 3:02. JAX – Josh Scobee 39-yard field goal, Jaguars 27–20. Drive: 4 plays, 0 yards, 1:43. BUF – Dan Carpenter 42-yard field goal, Bills 3–0. Drive: 4 plays, 1 yards, 0:48. JAX – Josh Scobee 32-yard field goal, Tied 3–3. Drive: 6 plays, 19 yards, 1:48. JAX – Ace Sanders 12-yard pass from Chad Henne (Josh Scobee kick), Jaguars 10–3. Drive: 10 plays, 56 yards, 3:33. BUF – Robert Woods 6-yard pass from EJ Manuel (Dan Carpenter kick), Tied 10–10. Drive: 9 plays, 94 yards, 4:05. BUF – EJ Manuel 8-yard run (Dan Carpenter kick), Bills 17–10. Drive: 8 plays, 72 yards, 3:27. BUF – Dan Carpenter 40-yard field goal, Bills 20–10. Drive: 3 plays, 39 yards, 0:26. JAX – Josh Scobee 55-yard field goal, Bills 20–13. Drive: 5 plays, 39 yards, 2:00. JAX – Marcedes Lewis 13-yard pass from Chad Henne (Josh Scobee kick), Tied 20–20. Drive: 7 plays, 55 yards, 2:25. BUF – Frank Summers 1-yard pass from EJ Manuel (Dan Carpenter kick), Bills 27–20. Drive: 9 plays, 80 yards, 4:15. TEN – Rob Bironas 45-yard field goal, Titans 3–0. Drive: 7 plays, 64 yards, 3:46. JAX – Marcedes Lewis 4-yard pass from Chad Henne (Josh Scobee kick), Jaguars 7–3. Drive: 9 plays, 80 yards, 4:20. TEN – Rob Bironas 52-yard field goal, Jaguars 7–6. Drive: 11 plays, 32 yards, 5:11. JAX – Mike Brown 7-yard pass from Chad Henne (Josh Scobee kick blocked), Jaguars 13–6. Drive: 7 plays, 60 yards, 1:12. JAX – Josh Scobee 36-yard field goal, Jaguars 16–6. Drive: 8 plays, 17 yards, 4:25. TEN – Shonn Greene 1-yard run (Rob Bironas kick), Jaguars 16–13. Drive: 11 plays, 80 yards, 5:21. TEN – Nate Washington 30-yard pass from Ryan Fitzpatrick (Rob Bironas kick), Titans 20–16. Drive: 9 plays,73 yards, 3:47. IND – Donald Brown 1-yard run (Adam Vinatieri kick), Colts 7–0. Drive: 8 plays, 42 yards, 3:08. IND – Trent Richardson 2-yard run (Adam Vinatieri kick), Colts 14–0. Drive: 7 plays, 54 yards, 2:20. IND – Adam Vinatieri 23-yard field goal, Colts 17–0. Drive: 12 plays, 74 yards, 4:27. JAX – Josh Scobee 37-yard field goal, Colts 17–3. Drive: 11 plays, 41 yards, 4:27. IND – Adam Vinatieri 26-yard field goal, Colts 20–3. Drive: 6 plays, 31 yards, 0:53. IND – Griff Whalen 7-yard pass from Andrew Luck (Adam Vinatieri kick), Colts 27–3. Drive: 7 plays, 80 yards, 4:21. IND – Adam Vinatieri 39-yard field goal, Colts 30–3. Drive: 7 plays, 43 yards, 3:49. JAX – Kerry Taylor 14-yard pass from Chad Henne (Josh Scobee kick), Colts 30–10. Drive: 9 plays, 91 yards, 1:36. ↑ Cincinnati defeated Indianapolis head-to-head (Week 14, 42–28). ↑ Pittsburgh finished with a better division record than Baltimore. ↑ Pittsburgh defeated the New York Jets head-to-head (Week 6, 19–6). ↑ Baltimore defeated the New York Jets head-to-head (Week 12, 19–3). ↑ The New York Jets finished with a better division record than Miami. ↑ Oakland and Jacksonville finished with a better conference record than Cleveland. ↑ Oakland defeated Jacksonville head-to-head (Week 2, 19–9). ↑ Jacksonville defeated Cleveland head-to-head (Week 13, 32–28). ↑ O'Halloran, Ryan. "Jaguars trade D'Anthony Smith to Seattle". Jacksonville.com. Retrieved 31 August 2013. ↑ Crow, Alfie (October 2, 2013). "Eugene Monroe trade: Jaguars will get Ravens 4th and 5th round pick, per report". SBNation.com. Retrieved October 2, 2013.